Over the years, I can’t say that all “tips” lost, but they did not win more than the law of averages would suggest. Accordingly, when you get “inside information,” you must let it go in one ear and out the other. A related topic is when horses get bet down for no apparent reason – especially when you like a different horse in the race. This takes some discipline, but you must stand your ground and wager on the horse you like, even though another horse appears to be the “hot horse” on the toteboard. There were times I abandoned the horse I liked and placed a wager on the “hot horse.” Sometimes I won. But there were times when the horse I originally liked won, and I got sick to my stomach. If there is anything worse than losing a race, it is abandoning a horse you liked only to see him win. Accordingly, you should look at the board, but hope that the odds (including exactas) on your horse go up, not down. Historically, the lower the odds on a horse, the more likely he is to win. However, not all even-money horses are created equal, nor are horses at 2-1, 3-1, etc., created equal. If you like a horse and expect him to be 2-1, it is true that if he gets bet down to 3-5, he probably stands a better chance of winning than he would if he ended up 2-1. But the name of the game is value, making a profit, and having an “index” above 1.0 (or a Return on Investment (ROI) above 0). A 3-5 shot must win 63 percent of the time to be a break-even proposition However, a 2-1 shot only needs to win 33 percent of the time to break even. I analyzed the wagers I placed in 2017, and found something interesting. I take a “Moneyball” approach to handicapping (see the column titled “Chart Your Biases” in the March 2017 issue) and one of the variables I always tracked was the closing odds. I divided my spreadsheet into five groups (quintiles) based on odds. Not surprisingly, the quintile with the lowest odds won the most frequently. The quintile with the second-lowest odds won second-most frequently. However, the important variable is index, not win percentage, and the differences were significant. The quintile with the lowest odds had the second-lowest index, and the quintile with the highest odds had the highest index. The middle quintile had the lowest index. This chart is not universal. It reflects my wagers in 2017. Over the last 14 months, I have identified some winning wagering angles. This includes horses off a good qualifier, horses with very short layoffs, horses with a “hot” trainer or “hot” driver and shippers which meet certain criteria. Conversely, some horses should be avoided – horses with posts 7 and 8 on a half-mile track, and horses coming off a scratch lame, injured or sick. The fifth quintile, or the horses with the highest odds, is eye-popping because of the 1.656 index, or 65.6 ROI. It was not spiked by “outliers.” If the three highest priced winners were deleted, the index would still be 1.42. This point leads to one important rule: wager as much on a longshot as you would on a heavy favorite. Many bettors may wager less on a longshot, figuring that they will still make a nice profit on a longshot even if a smaller amount is at risk. Note that “Moneyball” works on the assumption that the same amount is wagered each race. You should not determine your wager size based on the horse’s odds. Note that about two years ago, I saw some value in favorites if they met certain criteria. But this past year, I noticed that at least at some tracks (Freehold, Dover Downs, etc. ), it seemed as if the favorites got bet down to ridiculously low odds. Horses that once may have been $3.20 are now $2.60. And they often lost. Another problem was that most of the money came in on the last two updates. Accordingly, I have adjusted my strategy, seeking higher-priced horses while avoiding heavy favorites. Remember, handicapping is a dynamic, not a static, process. Harness racing tends to be “chalky” –meaning that favorites win at a high rate–and a good longshot is hard to find. But they are out there, and when you do find one, don’t let anyone talk you out of it, and don’t be discouraged by the lack of “action” on the horse. 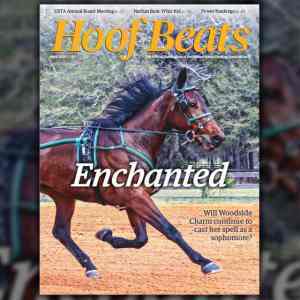 To see inside the March 2018 issue of Hoof Beats magazine, click here.